Cross-sector collaboration can be complex and sometimes opaque, bringing together multiple stakeholders with differing institutional logics, motivations, and practices, who are often navigating ambiguous decision-making processes with varying formality. At The Intersector Project, we produce resources to try to help practitioners navigate these complexities. Last year we created an extensive list of questions intended to help those interested or involved in a particular cross-sector collaboration better understand the complexities and nuances of the program or initiative. To get you started, here are the first two categories of key questions to consider. Explore more questions and download the list of questions to share with your stakeholders and cross-sector partners on our website. What offices, agencies, organizations, and companies are partnering in this collaboration? What individual(s) will represent each of them within the partnership? Have the partners enlisted the assistance of a facilitator, negotiator, manager, or other third party to assist with the design, implementation, or evaluation of the collaboration? If so, who is this individual or organization, how was the individual or organization chosen, and what is their track record of success in previous cross-sector collaborations? Who is providing funding for this assistance? Have the organizations and individuals involved worked together previously? If so, were those relationships successful (e.g., were they characterized by trust and goodwill and did they produce desired outcomes)? 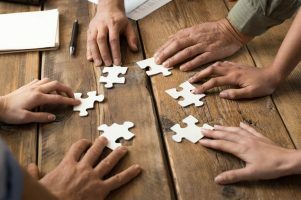 Have the organizations and individuals involved participated in previous cross-sector collaborations, whether with these same partners or with others? If so, were they successful or not? What process was used to determine whom to include in the partnership? Have any critical partners been left out? If so, who are they, why were they left out, and what are the potential downsides of their not being included? Has the public been consulted on this partnership’s work in a meaningful way? If so, how (e.g., through public meetings or hearings, formal surveys, public comment periods, ballot measures)? If not, are partners considering a public consultation process of some kind? Was/Is the public consultation process required or voluntary? Has/Will this process focus on engaging members of the public who are most likely to be affected by the collaboration’s work? What is the collaboration’s process for acting upon the feedback received through the public consultation process? What signs of public support or opposition are observable, if any? What is the reason for this public support or opposition? Does the opposition pose a risk to the work and outcomes of the collaboration? If so, how will the collaboration mitigate that risk? Why Was a Cross-sector Approach Chosen? What is the partnership’s “genesis story”? When did it begin to take shape? What individual(s) or organization(s) initiated the partnership, and what initial problem, issue, or event led them to do so? When and why did each partner get involved in the partnership? What other approaches were considered or attempted before choosing a cross-sector approach? Did an individual or organization consider or attempt addressing this problem on their own before pursuing a cross-sector solution? If so, why wasn’t that effort successful? If not, why wasn’t that attempted before involving cross-sector partners? Why was a cross-sector approach ultimately chosen over other potential approaches? What evidence, if any, was used to make that decision? If the public sector is involved, was a formal analysis used to determine why a cross-sector approach was pursued? What problem or issue is the collaboration aiming to address? In what terms is the problem being defined? For example, is the problem being defined financially (e.g., cost issues), in terms of values (e.g., accessibility issues, equity issues), operationally (e.g., ineffective program), or otherwise? Do all partners agree with how the problem is defined? If not, where are there differences? Do partners anticipate that those differences will create problems for the collaboration? Do partners have sector- or organization-related biases related to how the problem is defined? What information and data are partners reviewing to understand the problem or issue? What program or initiative is the collaboration proposing to address the problem or issue? Explore the remaining categories (“What Resources Are Involved?”, “What Risks and Rewards Is Each Partner Taking On?”, “How Are Partners Working Together?”, “and What Are the Potential or Actual Outcomes?”) by visiting our website.